Help children with their homework, combining the public school method with Montessori’s approach and manipulatives. Our intention is that parents have the opportunity to spend their evenings enjoying quality time with their children rather than worrying about keeping up with schoolwork. Develop indispensable life skills and values such as respect, compassion, responsibility and courtesy by following Maria Montessori’s consciously designed approach to teaching. Offer opportunities for hands on learning in subject areas specific to a child’s interests outside of the regular public school subject matter allowing him to thrive in a variety of settings. Promote a healthy, active lifestyle by inviting children to participate in supervised, self-directed free play in an outdoor setting, enjoying the beauty of our earth and establishing a sense of stewardship for the environment. We go get children from Ste-Thérèse, Anna Malenfant, Amirault, Champlain, Arnold H. McLeod and Lou MacNarin schools for our after school program. Children can be picked up at our facility as late as 5:30. Drop off starting as early as 7:30 am with classroom instruction between 9 am and 11:30 am. Children are to be picked up at 11:30 am. Drop off at 12:50 pm for classroom instruction between 1 and 3:30 pm. Afternoon pick up is between 3:30 and 5:30 pm. Drop off starting as early as 7:30 am with classroom instruction between 9 am and 3:30 pm (lunch hour exclusive). Children may be picked up as late as 5:30 pm. NOTE: As we are a private school we remain in close contact with the NB Department of Education regarding any and all curriculum changes at the Kindergarten level. Practical Life exercises that assist children in learning to take care of themselves, each other and the environment. Sensorial activities which provide specific opportunities for exploration which refine the senses. Language exercises that nourish the child, enrich vocabulary, enhance self-expression and develop reading and writing skills. 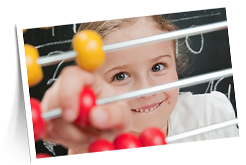 Mathematical materials which offer exciting, concrete experiences of number concepts and operations. 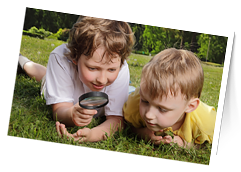 Science and Geography activities are designed to help the child make discoveries about the physical world and its many wonders, while gaining an understanding of our relationship to the earth. Caring for plants or participating in visits from animals creates and nurtures interest in science and respect for life. As with all children who attend Montessori Dieppe, Kindergarten children form part of multi-aged classrooms. Interaction with their younger peers is an important part of the learning process for Kindergarten students. Such interactions present Kindergarten students with the opportunity to learn or hone non-academic knowledge and skills such as: empathy, compassion, leadership, grace, courtesy, etc. While our Kindergarten program is language intensive, it also excels in geography, mathematics and science. Our Kindergarten program does not have a pass/fail grading system, but aims to simply work through the material at the child’s pace. Unlike the public school, our classroom is often full of children working on a variety of different projects rather than everyone doing the same thing. We follow a pre-determined curriculum, but allow the students to choose their own work on a daily basis, which gives them a chance to focus on their interests. There is also no focus on homework at Montessori Dieppe, although we may send home readers or words for the parents to practice with their child. This is an activity that the students take much pride in and it doesn’t feel like extra work. The school offers bilingual story/circle time with parental permission. Twice a week, francophone students are read an English story, and Anglophone students are read a French story. During this time, children also practice their second language by listening and repeating, and by using visuals. In addition, English students have the opportunity to participate in French as a second language sessions to make sure they receive plenty of practice time. These additional sessions incorporate hands on activities and interactive games as we strive to maintain their focus and ensure that we meet all of their different learning needs. Complementary programs such as Art, Music, Second Language and Physical Education also form part of the Montessori Dieppe curriculum. These programs are drawn from the Kindergarten outcomes created for the NB Anglophone School District. These outcomes were modified to include Montessori methods and are taught weekly in both the French and English classrooms. Art: Each month, students focus on and learn about one specific artist. This artist is the inspiration for the art projects during the month. The school’s easel area is transformed to display the artist’s work and to create an atmosphere that feels similar to what that artist would have enjoyed working in (for example, if our artist enjoyed painting outside our easel would be surrounded by plants to give it an outdoor feel). Music: Similar to the Art program, students study a different musician each month. The students are exposed to a variety of types of music, including classical, contemporary and jazz. Each month, the school chooses a musician and an artist with similarities to help the students make connections between the subject areas and to ensure that they have a firm understanding of what is being taught. Physical Education: The Physical Education classes start with a focus on balance and spatial awareness, but continue to expand as the students establish their skills. The classes are mostly held in the classroom. As the weather permits, the school also holds physical education classes outside in the playground, and at the local park. This program ensures that the students grow in their appreciation for physical activity, learn new skills, and play fun games. We ask that your child has comfortable sneakers during this class time.